As you may or may not have guessed I am in Berlin, Germany. The past two days have been eventful and after those two days I have found that this is one of my favorite, if not my favorite European city I have been in. I arrived to the city centre of Berlin at about 1130 and proceeded to realize I had no idea where I was. However, i found my bearings and proceeded down the Spree river toward Reichstag and Brandenburger Tor, two famous Berlin sights. I knew Berlin was a modern city in terms of architecture but I didn't realize that nearly both sides of the river held modern buildings that seem to be very, very young. 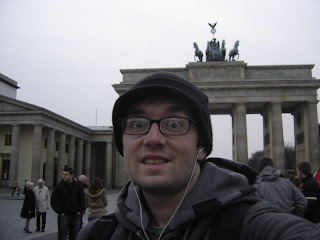 As I continued my trek down and then across a pedestrian bridge, I made my way to the Reichstag and then to Brandenburger Tor, one of, if not the most recognizable Berlin landmark. Standing in front of the Tor, or gate, I watched as a man portraying a soviet soldier took money from people as they took pictures with him. For you not in the know, the Berlin Wall that seperated East Berlin from West Berlin passed right behind the Brandenburger Tor. Also, the celebration of the fall of the Berlin wall took place mainly in the square adjacent to the Tor, in November 1989. I didn't pay for a picture or the fake passport stamp you could buy. Walking on I took a few minutes to admire and question the Holocaust memorial. As you can see in the picture, it is a most peculiar looking thing. Taking up an entire city block, there are black stone rectangular pillars even distances apart from each other. At the same time the ground rolls slightly every few rows of pillars with the level of the ground lowest in the center. While in the center looking in all four directions the ground moves upward, the pillars are over 10 feet tall and most of the sun is blocked out. Quite interesting. From there I left and headed toward Potsdamer Platz and then toward (T o T). There I read about the ground at which this memorial sat. Apparently it is where the entire 3rd Reich operation took place from. This was where the administrators of the Nazi terror machine coordinated everything from the concentration and death camps as well, torture of enemies as well as the plan for taking over the the whole of Europe. After there I was in quite a good state of mind, which may seem strange considering my activities the previous hour or so. I then headed toward Checkpoint Charlie, where the American controlled section of Berlin began or ended depending on the way you are looking at it. There is a museum there but I didn't go into it. I instead went into a true Berlin trademark; Starbucks. There I sat for a bit and had a cup of AMERICAN coffee, something Italians did not get, sadly. From there I made my way toward the Jewish Museum but found it too expensive and then walked back toward down town. While there I walked through Alexander Platz where ( - ) is and then toward the Berliner Dom, where I stopped to have a Brat and some fries. While there I sat at a table with a older gentlemen, who I thought at first was talking to no one in a loud tone of which I could understand nothing. As I began eating he turned to me and began talking in German, and as soon as he began talking he reallized I was catching nothing of what he was giving, probably due to the blank stare I was giving him. He asked where I was from, to which I told him the United States and Indiana. At that moment, there started the some of the best few minutes I have had since arriving in Europe. He talked about travelling to America, politics, London and Berlin. He asked me questions here and there but mainly just talked about America and his adventures working in Chicago, Ohio and New York. The entire time I didn't reallize it but I was speaking to a fellow journalist. As we finished our conversation that interestingly ended on the subject of music and the Beatles, interestingly enough, he asked for my address in the U.S. and he gave me his business card. It was then that I realized Helmnut Ratzlaff was a journalist and lawyer.